Yellowcard has signed to Razor & Tie for a worldwide multi-album deal that will see the release of a new studio album this Fall. Yellowcard will hit the road this summer on the VANS WARPED Tour kicking off on June 13th (tour dates below). American pop-rock band Yellowcard has always separated itself with its distinctive sound, featuring a violin, which is unique in the genre. Formed in 1997, Yellowcard has released 8 albums and 3 EPs to date, including the Platinum certified Ocean Avenue and Gold certified Lights and Sounds. Five of the band’s albums have debuted on the Billboard Top 20 and they have sold over 3 million albums and 4 million tracks worldwide. 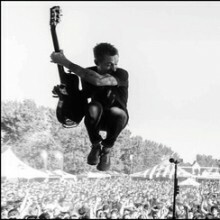 Yellowcard has had 4 top 25 songs at Alternative Radio (“Ocean Avenue,” “Way Away,” “Only One,” and “Lights and Sounds”) and “Ocean Avenue” has been certified multi-platinum and also peaked at #37 on the Billboard Top 100. The band has been featured on the cover of Alternative Press and has been one of the headliners of the Vans Warped Tour four different years. In the past few years they have also toured with All Time Low, The Starting Line, The Wonder Years and many others. Last year the band released Ocean Avenue Acoustic as the 10th anniversary album and played across North America in support to sold out audiences. Evoking emotions that often erupt into massive sing-alongs at live shows, Yellowcard have been riding a crest of positivity with their best-reviewed albums of their career and a huge international fanbase that keeps growing exponentially. Yellowcard is Ryan Key (Vocals, Guitar), Ryan Mendez (Guitar, Background Vocals), Sean Mackin (Violin, Background Vocals), and Josh Portman (Bass). YELLOWCARD Celebrates 10th Anniversary of Ocean Avenue With Release of Acoustic Version; Announces Tour.